Career Arrows are one of Pack 44's most popular traditions. Arrows are marked to show the major achievements in a boy's Cub Scout career. The arrows are then presented during the Arrow of Light/Webelos Graduation ceremony. There are many packs that prepare career arrows and probably just as many different methods for marking. Some use a sparse system while others have markings for every event. Pack 44 marks arrows to show rank advancements, arrow points, activity pins, and religious awards. This mix makes for an attractive arrow that is not cluttered. Besides, the Scouts have the pack and segment program to commemorate other pack activities. The arrow show at the top of this page is our "Challenge Arrow". This arrow shows the maximum possible markings. Lets just look through it and see what the markings mean. The career marks start at the feathers and move towards the point. 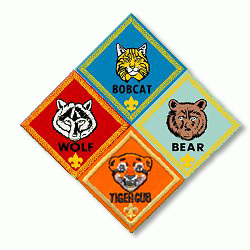 The orange bar with black ends indicates that the Scout was a Tiger Cub. A white bar with blue ends is for the Bobcat badge. The red bar with white ends marks the Wolf badge. The gold and silver bands indicate gold and silver Arrow Points. The Bear badge is shown by a green band with white ends. The next set of gold and silver bands are for the Arrow Points earned for the Wolf badge. A purple band indicates a religious award. Many Scouts earn a religious award during their second year, as shown here, but it can be earned in any year. Some Scouts earn more than one religious award. The blue band with white ends is for the Webelos rank badge. The black bands indicate the number of Activity Pins the scout has earned while a Webelos Scout. The Webelos badge has a formal religious requirement. Many Scouts earn a Religious Award at this time. The last award shown is the Arrow of Light. This band mixes the blue and gold of Cub Scouting with the red of Boy Scouting. The Scouts also receive a laminated card explaining the markings. First... Where are you going to get the shafts? Check with your local archery outfitter. You don't need the best shafts. In fact, they don't even have to be perfectly straight. You can make good looking arrows from slightly warped shafts and might even get them free. Start looking for arrows well in advance and be sure to get extras. Second... What are the shafts going to look like? We have ours painted yellow with two blue and one yellow feathers. If possible we use a blue plastic nock. At the other end of the arrow we use a rounded target point. You can buy plastic arrowheads that look like knapped flint. They look nice but add to the cost. Don't use a sharp hunting point. Those things are just too dangerous and they make it hard to prepare the arrows. Last... How are you going to make the bands? In the past we have use various colors and widths of chart tape. The tape is easy to use and looks good but has a big disadvantage. After time the tape can come unstuck and peel off. Paint is more durable but using a brush takes a real steady hand and a better eye than I've got. But there is a happy medium. We use paint sticks. These are like magic markers but contain enamel paint instead of ink. You can find a variety of colors at your local discount store. Look in the model car and airplane section, the handicraft area, paint supplies, and the automotive area. You can also find them in hobby shops and so forth. The most useful ones have a chisel tip instead of a point. With the chisel tip you can turn it one way for a narrow line or turn it the other for a wider line. OK, how do I put the paint on the arrow? The easiest way is to rotate the arrow. I took some scrap wood and threw together a holder for a variable speed drill. The tip is chucked into the drill and there's a felt covered sliding support for the other end. With the drill set on slow speed it is easy to make the bands. First paint on the basic colors for rank badges, arrow points, and activity pins. I start with the Tiger Cub colors near the feathers and working up to the Arrow of Light near the tip. Then I set the arrow aside to dry while work on the others. After the paint has dried I set it up again and add the end colors to the rank badge markings. Two additional hints. One, it really helps to have a list of boys and awards in order. Two, write the boy's name on a piece of tape and put it on the nock so the arrows don't get mixed up. Career arrows are a great tradition and the boys really like them. If you have a career arrow tradition then keep it going. If not, why not start?